Surprisingly simple modifications of a pest's environment or habitat often prove to be effective methods of pest control. As a group, these tactics are usually known as cultural control practices because they frequently involve variations of standard horticultural, silvicultural, or animal husbandry practices. Since these control tactics usually modify the relationships between a pest population and its natural environment, they are also known, less commonly, as ecological control methods. Simplicity and low cost are the primary advantages of cultural control tactics, and disadvantages are few as long as these tactics are compatible with a farmer's other management objectives (high yields, mechanization, etc.). Unfortunately, there are still a wide variety of insect pests that cannot be suppressed by cultural methods alone. Crop rotation is one of the oldest and most effective cultural control strategies. Growing a single crop year after year in the same field gives pest populations sufficient time to become established and build up to damaging levels. Rotating the field to a different type of crop can break this cycle by starving pests that cannot adapt to a different host plant. Farmers in the Midwest, for example, can reduce populations of wireworms (Elateridae) and rootworms (Diabrotica spp.) in corn fields by switching to oats, wheat, or legumes. Similarly, the clover root curculio (Sitona hispidula) that feeds exclusively on legumes can be eliminated by switching from clover or alfalfa to corn or small grains. Rotation schemes have also proven successful for controlling pests in pasture lands. Texas cattle fever, a protozoan disease transmitted by cattle ticks, Boophilus annulatus, has been eliminated from the southern United States due, in part, to a diligent campaign of pasture rotation designed to protect beef and dairy herds from tick infestation. Intercropping (also known as mixed cropping) is another way to reduce pest populations by increasing environmental diversity. 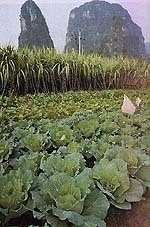 In some cases, intercropping lowers the overall attractiveness of the environment, as when host and non-host plants are mixed together in a single planting. But in other cases, intercropping may concentrate the pest in a smaller, more manageable area so it can be controlled by some other tactic. Strips of alfalfa, for example, are sometimes interplanted with cotton as a trap crop for lygus bugs (Miridae). 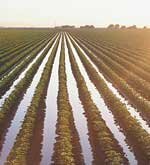 The alfalfa, which attracts lygus bugs more strongly than cotton, is usually treated with an insecticide to kill the bugs before they move into adjacent fields of cotton. In some crops, it is possible to create discontinuity in the pest's food supply simply by altering the time of year for planting or harvesting. This strategy, often known as phenological asynchrony, allows farmers to manage their crop so it remains "out of phase" with pest populations. Sweet corn, for example, can escape most injury from corn earworms (Helicoverpa zea) if it is planted in early spring and harvested before larvae mature. In the Midwest, farmers delay planting winter wheat until after the "fly-free date" to protect their crop from injury by the Hessian fly (Mayetiola destructor). These planting dates are calculated to ensure that wheat is not mature enough to attract egg-laying flies, yet still has enough warm weather to grow sufficiently before winter. Careful timing of harvest dates in alfalfa can cause high mortality in populations of alfalfa weevil (Hypera postica) and alfalfa caterpillar (Colias eurytheme) by removing edible foliage before the larvae have completed development. Harvest timing is often the most practical method available to foresters for controlling bark beetle (Scolytidae) infestations in pine plantations. Since trees become more susceptible to beetle outbreaks as they grow older, good management dictates that timber stands be harvested for lumber before the trees reach full maturity. Managed application of water or fertilizer can have a big impact on the survival of pest populations in some crops. Annual flooding, for example, is a cultural practice that eliminates many potential pests in cranberry bogs. Regular rainfall (or overhead irrigation) can significantly reduce infestations of twospotted spider mites (Tetranychus urticae) in tree fruits. Good irrigation and appropriate fertilization keeps plants healthy, vigorous, and more resistant to insect injury. It is not unusual for small amounts of injury to actually stimulate compensatory growth in healthy plants. Sanitation is another cultural control strategy that may be highly effective for some pests. Removing crop debris from cotton fields after harvest eliminates overwintering populations of pink bollworms (Pectinophora gossypiella), European corn borers (Ostrinia nubilalis), and sugarcane borers (Diatraea saccharalis). 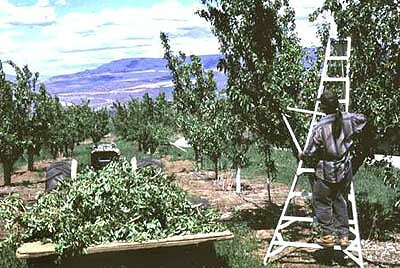 Collecting dropped fruit from beneath an apple tree reduces the next season's population of apple maggots (Rhagoletis pomonella), codling moths (Cydia pomonella), and plum curculio (Conotrachelus nenuphar). Shredding or burning the pruning wood from a peach orchard kills shothole borers (Scolytus rugulosus) and lesser peachtree borers (Synanthedon pictipes) that would otherwise emerge and reinfest the orchard. Clean cultivation is often recommended as a way to eliminate shelter and/or overwintering sites for pest populations. Simply tilling or plowing a corn field before winter may disrupt a pest's life cycle by causing mechanical injury, by increasing exposure to lethal cold temperatures, by intensifying predation by birds or small mammals, or by burying the pests deep beneath the soil surface. Populations of corn earworms and European corn borers have been greatly reduced in recent years by community-wide efforts to plow under corn stubble after harvest. Although it works well in corn and cotton, clean cultivation is not always the best solution for eliminating pest populations. In some cases, ground cover or crop debris shelters natural enemies that are important members of the agroecosystem. Without adequate shelter these beneficial populations would die or move away.